“Bloodsport” – With his family in the bloody clutches of a madman, professional stuntman Sami “Sam” Nasser takes to the road, blazing a vengeful path towards psychotic gang lord Dominus Smith. 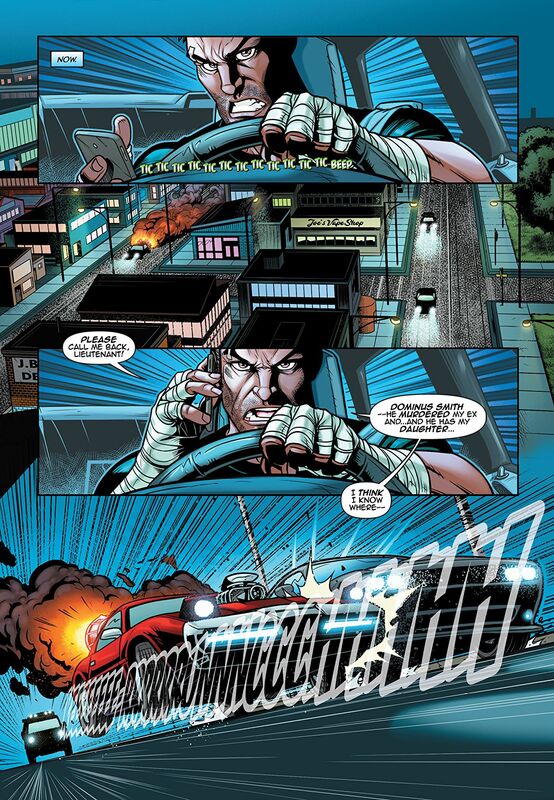 But Sam’s not the only driven man on the streets of Studio City tonight, as he’s quickly ensnared in a death race between the unbalanced vigilante, Beatdown, and viperous street pirate Crash Cummings! There’s an all-new terror gathering at this grim finish line, one nobody saw coming…but they should have. 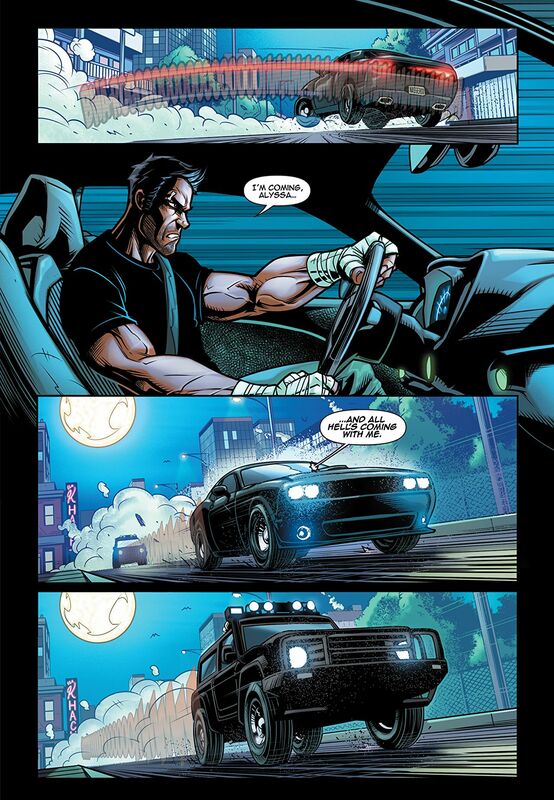 Also: don’t miss the fast and furious debut of the masked marauder known only as “Knuckleball”! Capturing the bombastic tones of ’80s and ’90s action films, writer Joe R. Khachadourian (TRANSFORMERS: MOSAIC), artist J. Briscoe Allison (SWEET LULLABY), and cover artist Tone Rodriguez (SHADOWHAWK) bring you a relentless odyssey involving complex characters, a touch of romance, and a fistful of masked lunatics! Stuntman Sami “Sam” Nasser has been very incorrectly outed as the vicious vigilante known as “Beatdown”, by known megalomaniac (heavy lean toward the “maniac”) Dominus Smith. Having fought off one retaliatory attack, Sam has been on his heels trying to figure out the why and how of his new pseudo-celebrity status instead of dealing with it. In a definitive step toward ensuring Sam’s full participation in his schemes, Dominus Smith murdered his ex-wife and kidnapped his daughter Alyssa. The elements are converging, and the Fall Guy is stepping up to make the wrong things right. Issue three of this high octane four issue series kicks it up to 11, with all the fast-paced action and obscure pop culture references you can shake an “I Love the 80’s” flashback VHS tape at. The plot threads have been laid out, the players have been put in place, and now it’s all over but the inevitable car chase. If it’s an essay on societal norms and morays evolving to encompass new paradigms that you’re looking for, move along cuz this book ain’t it. If you’re not entirely sure why the “Fall Guy” reference is fitting, hand the book to your Dad and see if he chuckles. In the opening issue, writer Joe Khachadourian established Sami Nasser as the go to stunt man working in a CG age. Not a bad guy at all, just doing his best to make a living and maybe mend a fence or two with his ex, Tracy. In the second instalment, Khachadourian established Sam with a few more bonafides (military service and obligatory martial arts mastery), to justify the chaos he was about to endure. 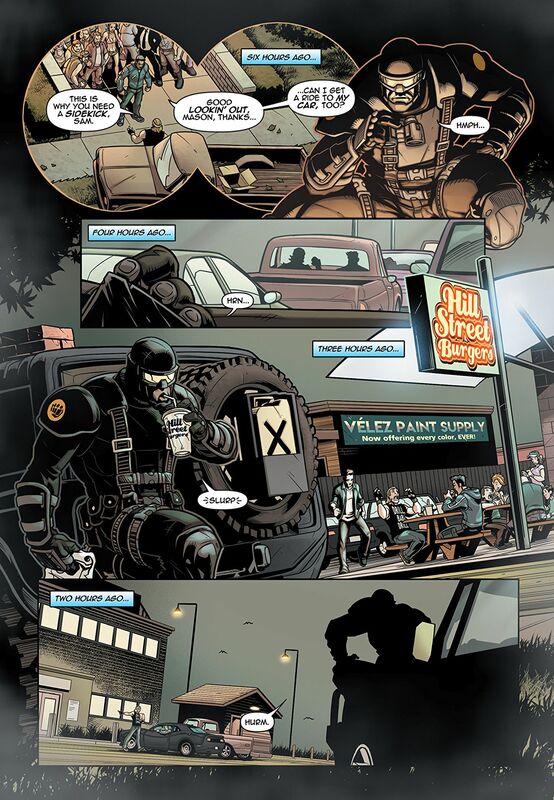 Now in the third act we get a little deeper into Sam’s background, as well as that of his best friend and service buddy Mason (required “on the edge” Special Forces veteran). Without going too far into spoiler territory, I can say that Khachadourian knows when to drop a plot point, how to draw out a character arc, and has a pretty solid handle on 70’s & 80’s television shows (by the way, Mason, Tom Hanks’s partner in Bosom Buddies was Peter Scalari, who is also an accomplished juggler). His references to both TV and movies shows a love for all things retro-action (dude, seriously… The Wraith! ), to include the much maligned direct-to-video market. All I’m waiting for at this point, to really lock in my growing love of this series, is a reference to “Martial Law” or Don “The Dragon” Wilson. On board and up to the task for the action-oriented visuals, J. Briscoe Allison & Juancho Velez are on point. Allison’s character designs are larger than life, and if this were anything but what it is I’d have to wonder how in the world every person in the series could possibly be built like a professional wrestler. In the context of this highly unlikely chain of events, it all makes perfect sense. 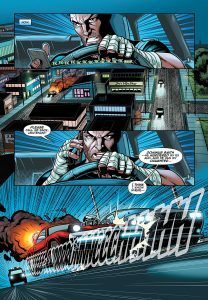 And just to keep things interesting, issue 3 lets Allison and Velez go all Road Warrior with a car chase that would have made The Lord Humongous want to “just walk away”. The scene lets the artistic team drop some nifty motion effects in the use of color and blur effects that add to the title’s cinematic flair. 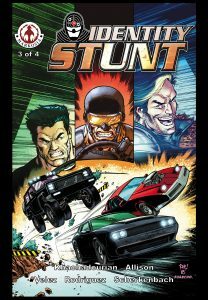 To be perfectly honest, this series is an ongoing love letter to the insane and ridiculous action flicks of yesteryear, where heroes were steely-eyed adrenaline junkies and everyone was an 18th degree black belt. If this comic were a movie that was made back then (direct to video, obviously), there would be roles for the likes of Jeff Speakman, Cynthia Rothrock, and Richard Norton… and I can’t see anyone but Richard Lynch in the role of the evil and quite insane Dominus Smith. Don’t let any of that push younger readers away from taking a look at Identity Stunt. Just be aware that there could be a few Easter Eggs that you may have to look up on IMDB (link posted for your convenience). This is a highly unlikely, completely unrealistic, and so far as I’m concerned thoroughly entertaining title, and I’m gonna miss it when it’s done. Now get thee hence to wherever it is you get your comics (or in this case, ComiXology) and buy this book. Just make sure to bring your suspension of disbelief with you, cuz things are starting to get a little nuts.